handing out smartphones to flight attendants, I took notice. This is a big deal and it’s a good thing. What Delta is doing is rolling out Nokia 820 phones for its own flight attendants to use onboard. Delta Connection will follow soon after. The initial use will be a mundane one. Today when you buy something on an airplane, the credit card doesn’t get run until you’re back on the ground. So it’s easy for anyone to use a dead or fake card without anyone knowing. This will allow for real-time processing and that will kill fraud. Delta loves this, but it’s not exactly interesting to travelers, right? You’d be surprised. With less chance of fraud, Delta will be more willing to sell higher dollar items. So, Delta will start selling upgrades to Economy Comfort on the airplane, even during the flight. That’s a nice benefit. If you’re 1 hour into a 6 hour flight and you can’t feel your legs, you can upgrade yourself. Delta is continuing to develop tools for our 19,000 flight attendants to offer customers more personalized service and up-to-the-minute flight, weather and connection information specific for each of our 160 million yearly customers. We’ll also store manuals and important reference documentation on the device to virtually eliminate the need for printed materials. Think about that. Delta can push personalized information about each person in each seat so the flight attendants can know more about status levels, possibly short connections, or special events. Some of that may be on a printout in the galley today but this is going to make it much easier to actually use in all classes of service. Having reference docs readily available should make it easier for flight attendants to answer questions that may today end with a “talk to someone when we land” remark. Then if there’s a problem where a flight is late or diverted, Delta will be able to push information to flight attendants to help people inflight. There are so many opportunities to improve the interaction on the airplane thanks to wifi, and Delta is finally doing something about it. As if the benefits of this program aren’t good enough, Delta has to be getting a smoking deal. After all, Windows Phone 8 was mentioned 3 times in the release while Nokia 820 was buried down below, so clearly Microsoft is getting some bang for its buck here. And wifi is already on the airplanes – it’s just a matter of utilizing it. This is the kind of thing I had hoped we’d see when wifi first launch. It’s taken awhile, but Delta, at least, seems to be getting closer to making it happen. Cool! onboard gate agent. Can you imagine? Cxld flights, weather, reroutes, fights over who’s next for ec, interesting!!!!!! If Delta is selling more “premium products” then the free upgrades disapear. Correct? Wait a minute! Does this mean that their phones will be on AFTER the door to the aircraft has been closed and remain on while in flight? Not the phone part, just the Wifi part. JoeC – I would assume the devices would remain off until they hit 10,000 feet. Then they’d turn it on in airplane mode, only using wifi. Well the question is if Delta has gone through the trouble of certifying those phones for use during all phases of flight. Pilots use iPads or laptops during all phases of flight, its just a matter if that specific model of equipment is certified for use during all phases of flight with that model aircraft..
Can anyone say words with friends??? So NOW we can keep our electronic devices ON during takeoffs and landing? Or just the flight attendants? What’s going to stop the flights attendants from spending all their time in the back galley texting or posting on facebook? Presumably they (Delta) will lock down the devices to restrict what apps can be installed. welcome to corporate america? Plenty of people have company phones that do the same…. My Company issued us handhelds last year. They are bricked and only Co. authorized software can be loaded and used on them. Being Company property, they track EVERYTHING you do on there. Any F/A, Pilot, CSA, etc who would use them for F-book, WWF, Angry Birds or Fruit Crush is setting themselves up for termination under the ‘abuse and misuse of Company property’ clause. They made that VERY clear when we signed for them. Great for DL! I’m sure the Microsoft promos are part of DL’s push in SEA. So now we have AA and DL. Who’s next? Airlines are pretty tech savvy in comparison to the field I work in. In 2013 my employer still doesn’t provide smartphones to anyone below management. I’ve long argued that giving everyone a $50 monthy phone allowance is cheap compared to the increased productivity, i.e. people on email all the time. So has this been rolled out already? I have a DL flight over the holiday weekend and will keep an eye out. Frankly I had no idea the credit card transactions were delayed (knowing they had wi-fi). I could’ve been getting free drinks all this time?? Ha ha ha! David – There’s no question that airlines have underinvested in technology over the years because they haven’t made any money. It’s hard to make a big investment when you’re broke. Now that Delta is making a solid return, it can start doing more of these types of things. A – Not sure about rollout timing, but it should be very soon if not already. There aren’t too many industries where you can say that only a few years ago, frontline employees at every airline have had limited to no access to any sort of telecommunications, due to, oh, you know, being 30,000 feet above the ground. Talked to a few FA’s about them last week. They are worried about loosing them as the fee they have to pay Delta is not too bad the 1st time, but costly the 2nd+. Also, they are already taxed for time to get all they need done and the sales side could affect customer service side of the flight. Will be fun to see how it all washes out! Having the FA’s with these devices can be a double edged sward. It all depends on how & when they are used. The upside is having realtime information at the fingertips of the crew, but the downside is information overload wich will impeed job performance & will cause customer disatisfaction. They may have them, but will they use them to inform passengers of delays or whatever. The standard “the links down” “there’s no info yet” will become the standard reply when they are busy or really don’t want to be helpful. On the surface this plan seems to improve in-flight experience. For domestic flights, FA may only have enough time to relay weather and delays info. For international routes, it may help find answers to emerging issues during flight. An example may be a passenger that just lost their insulin supply finding the nearest pharmacy to fill the Rx. I remember your column reviewing business class service in AA and how the FA was unable to figure the steps for a passenger to log unto the Wi-Fi service. Also, years ago Delta advertised heavily the extensive training given to FA to be able to teach and recommend wines on board. Every time I ask about wines the reply is: “I don’t have time, I’ll pour a sample.” These are examples of the difficulties to modify or improve cabin service. My advice would be to concentrate in studying and adopting the successful practices that make other carriers top rated in service before adding responsibilities. There is heavy competition for international routes and the type of passenger that has money to spend for in-flight purchases is starting to demand a level of service that goes beyond empty apologies for things that go wrong and excuses not to be as attentive as the competition is. AA FA’s have had a Samsung Galaxy phone for months. It has glitches and the training and rollout don’t seem to have been smooth. They do have them and are supposed to be doing realtime credit card scans via the onboard Wi-Fi. 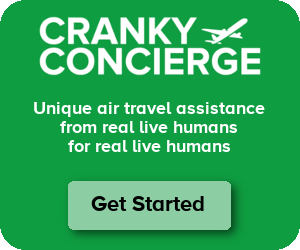 I’m really surprised Cranky didn’t note AA’s use of them a long time ago. Doesn’t mean they pay much attention, i.e. they know who are status fliers [to get free drink/snacks] but often pay no attention, demanding actual boarding passes or status cards instead. From their side, I heard complaints that they ran out of power on long flights and they became useless without bigger batteries/powerports for them to use. Not to mention very small font/map sizes that couldn’t be enlarged [definitely not an Apple product :)] making them have to pull out their glasses to try and read/operate them. Quite honestly, I’m really surprised I didn’t note AA’s use a long time ago as well. I’m not sure how I missed it, or maybe I simply forgot about it. But I should have covered it back then. FA1says to FA2, the guy in seat 3A wants another drink. FA2 replies, you take care of it. I need to finish this round of Candy Crush before management finds out. FA3, turns to look at FA2 & then returns to texting her boyfriend, the person who manages all FA’s for the airline. I sure as hell hope you’re having a humorous fantasy in your head!! Come on Kate, it was strickly ment as humor as I said in the top line. And yes, it was in my head… where else would it be. On a more serious note just to compare, I have friends who work at one of the malls on Long Island. If they go to their own FB page durring work time, an E-mail is sent from the management office reminding them that it is against policy to do that. I found out they also monitor social media usage even when off the job. I was putting things into perspective & trying to generate a few good laughs. sugar in their coffee, and this is repeated dozens of times – no time for “the info”. Oh…. and don’t blame the Flight Attendant for broken “anything” or inability to cater to “high maintenance” passengers. If the scheduled service is not delivered, THEY are disciplined. Expectations of both airline “officials” and passengers alike, need to come into the 21st century, and stop living in the 1950’s. You know as well as I do that the airlines will not increase FA staffing, but I do agree that techknology can only go so far & you still need people who can solve problems on the fly. (No joke intended there). Staffing levels may not be quite what they were, but they’re also not serving meals like they used to in Y. Now it’s just a couple of drink services even on transcons, with a few tossed sandwich/salads around until they run out. Then off to the back/behind the curtains for as long as possible. Some continue to work hard the whole flight, but that is the exception and not the rule. And if you show any interest/sympathy, they will unburden themselves as to how things are so bad. I know the companies have screwed them on pensions, but my feeling is if they’re staying on the job, then have as good a time as possible while doing it, and that should be based on service – and let their union reps negotiate better deals where possible. Keep in mind FA’s can be on duty for 16 hours without a break. Sometimes the only time to eat something is behind that curtain. The phones will only connect on the plane to Delta work sites so no worries about Facebook or whatnot on the planes. They are able to connect to Wi-Fi on the ground. The devices also received a waiver from the FAA to remain on below 10,000 feet. I always love how something is against the rules/law until it benefits the airline – then suddenly “waivers” appear, an voila! It’s all ok! AFAIK what devices are allowed to be on below 10,000 feet is part of the airline’s FAA approved standard operating procedures. The FAA is working on changing the 10,000 feet rule, but its slow going. I wonder how inflight seat upgrades will impact employee travel. Will they begin denying nonrev boarding for the nicer classes on the off chance that someone might want the upgrade later, or would they work out a swap where the employee was required to vacate first class in flight? Not gonna happen. EVERYONE says they are next on the upgrade list. It would be mutiny inflight. That’s the gate agents job-not the flight attendants. Hi, Eric – Just to clarify a few things: at this time we don’t have the technology to sell an upgrade to someone for first class, just the economy comfort section. We’ve actually asked that question (whether we’ll be allowed to sit in EC anymore and if we’ll be expected to vacate) and the official company statement is that seat assignments (for nonrevs) will continue as always – first available seats in seniority order. So if there are extra economy comfort seats, nonrevs will be seated there and NOT expected to swap mid-flight for someone who changes their mind and wants to purchase an upgrade to EC. Passengers always have the ability to upgrade their seat at the gate before boarding. And, if there are still available EC seats after everyone is cleared and settled, FA’s will still have the ability to sell those upgrades. Noah, I wish we had the ability to move the correct medallions up to first but we’re not given the upgrade list and thus have been told never to mess with that. It’s the gate agent’s job to manage that part of the process and I’ve personally witnessed medallions getting into a verbal altercation when my colleague attempted to upgrade who she thought was next on the list after the boarding door had closed. Perhaps it could be a technology improvement on the Prelude once we get through the initial trial and error months? Thanks for the reply, TrollyDolly! Just so ya’ll know we don’t get free wifi! So, in the air, we have to pay for it just like you if you aren’t selling things! You know, anyone with internet access can get on Delta.com for free during the flight and check your flight status. I’ve been doing this for years now. It would be faster for you to make the connection instead of waiting for the flight attendant to do it. I can see the ‘line’ forming just like at the gate when things go south. I just make the call or connect and avoid the whole thing. Not much new here, except they may be able to play Words with Friends with Alec!